The outline of each ellipse represents the motion the ground makes as the earth flexes in response to the time and space dependent ocean tides. There is an ellipse for each of the GPS sites used in the study, and the color indicates the amplitude of the tidal response movement. (PhysOrg.com) -- For many people, Global Positioning System (GPS) satellite technology is little more than a high-tech version of a traditional paper map. Used in automobile navigation systems and smart phones, GPS helps folks find their way around a new neighborhood or locate a nearby restaurant. But GPS is doing much, much more for researchers at the California Institute of Technology (Caltech): it's helping them find their way to a more complete understanding of Earth's interior structure. Up until now, the best way to explore Earths internal structuresto measure geological properties such as density and elasticityhas been through seismology and laboratory experiments. "At its most fundamental level, seismology is sensitive to specific combinations of these properties, which control the speed of seismic waves," says Mark Simons, professor of geophysics at Caltech's Seismological Laboratory, part of the Division of Geological and Planetary Sciences. "However, it is difficult using seismology alone to separate the effects that variations in density have from those associated with variations in elastic properties." Now Simons and Takeo Ito, visiting associate at the Seismological Laboratory and assistant professor of earth and planetary dynamics at Nagoya University in Japan, are using data from GPS satellite systems in an entirely new way: to measure the solid earth's response to the movements of ocean tideswhich place a large stress on Earth's surfaceand to estimate separately the effects of Earths density and the properties controlling response when a force is applied to it (known as elastic moduli). Their work was published in this weeks issue of Science Express. This movie shows the variation in the sea surface associated with the one constituent of the ocean tide, a pattern that repeats about every 12 hours and 25.2 minutes. This variation in sea surface height generates a periodic load on the earth, which is what was measured in the study. 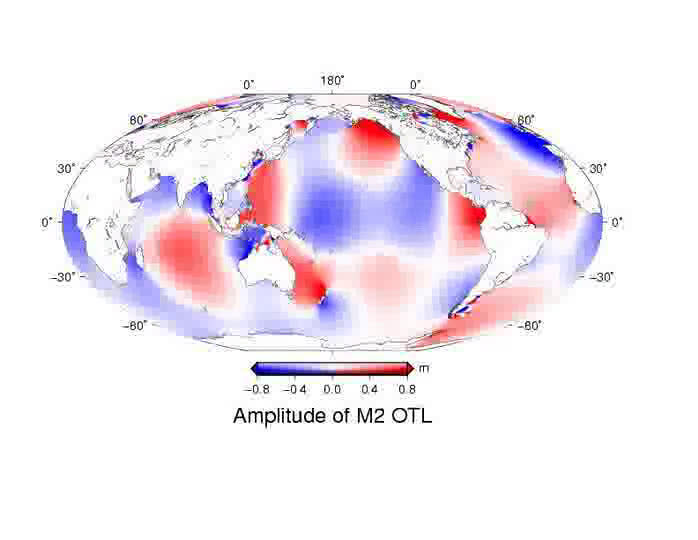 By using measurements of Earths movement taken from high-precision, continuously recording permanent GPS receivers installed across the western United States by the Plate Boundary Observatory (PBO), the researchers were able to observe tide-induced displacementsor movements of Earth's surfaceof as little as one millimeter. PBO is a component of EarthScope, a program that seeks to understand the processes controlling earthquakes and volcanoes by exploring the structure and evolution of the North American continent. 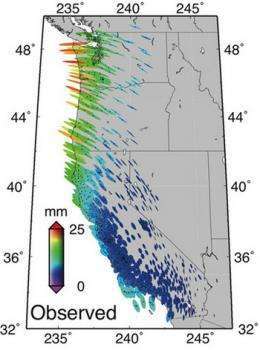 The team focused on understanding the properties of the asthenosphere, a layer of weak and viscous upper mantle that lies below Earth's crust, and used those measurements to build one-dimensional models of Earth's response to the diurnal tides in the western United States. "The asthenosphere plays an important role in plate tectonics, as it lies directly under the plates," explains Ito. "The results of our study give us a better understanding of the asthenosphere, which in turn can help us understand how the plates move." Still shot from a movie that shows the variation in the sea surface associated with the one constituent of the ocean tide, a pattern that repeats about every 12 hours and 25.2 minutes. This variation in sea surface height generates a periodic load on the earth, which is what was measured in the study. To watch the full movie, click here. The models provided a look at the variations in density from Earths surface down to a depth of about 400 kilometers. The researchers found that the density of the asthenosphere under the western United States and the eastern Pacific Ocean is abnormally low relative to the global average. "Variations in density can either be caused by variations in the chemical makeup of the material, the presence of melt, or due to the effects of thermal expansion, whereby a given material will decrease in density as its temperature increases," explains Simons. "In this study, we interpret the observed density anomaly to be due to the effects of elevated temperatures in the asthenosphere below the western United States and neighboring offshore areas. The required peak temperature anomaly would be about 300 degrees Celsius higher than the global average at those depths." This type of data provides keys to understanding the chemical and mechanical dynamics of the planet, such as how heat flows through the mantle and how tectonic plates on Earth's surface are evolving. "It is amazing that by measuring the twice-a-day centimeter-scale cyclic movement of Earth's surface with a GPS receiver, we can infer the variation of density 220 kilometers below the surface," says Simons. Now that the researchers know it is possible to use GPS to derive measurements of internal Earth structures, they anticipate several new directions for this research. "We hope to extend the observations to be global in scope, which may require temporary deployments of GPS in important areas that are typically tectonically blandin other words, devoid of significant earthquakes and volcanoesand thus do not have existing dense continuous GPS arrays already in place," says Simons. Next steps may also include going beyond the current one-dimensional depth-dependent models to build 3-D models, and combining the GPS approach with more conventional seismic approaches. "The method we developed for gathering data from GPS devices has significant potential for improving 3-D images of Earth's internal structure," says Ito. The findings of the study, "Probing asthenospheric density, temperature and elastic moduli below the Western United States," are available online in Science Express and will be featured in a future issue of the journal Science. More information: The findings of the study, "Probing asthenospheric density, temperature and elastic moduli below the Western United States," are available online in Science Express and will be featured in a future issue of the journal Science. Written by someone from Wisconsin? I love regional dialects. Seriously though. This is really cool. I wish them luck in getting funding to expand the work. The caption under the graphic with the ovals probably should note that the ovals are not intended to be in scale with the actual motion. It's obvious from the index bar, but I'm not sure a casual observer would figure it out intuitively. I think it's cool that they can detect movement caused by the ocean tides so far inland. That's most of the way accross Wa and Or, and even into Nv. That's a LOT of force. Talk about renewable energy. Imagine tapping that kind of force!! There has been some unwarranted sneering at the the idea that tidal forces affect the timing of earthquakes, but it seems to me that a regular cycle stresses capable of causing of up to 2.5 cm displacements, when superimposed on a slowly growing fault stress with non-linear stick-slip dynamics is a perfect situation for stochastic resonance effects to arise. Quakes should statistically happen when the tidal stress pushes the existing, slowly accumulating fault stress over the boundary from the stick into the slip regime.